Wine & Tours, in partnership with Les Climats de Bourgogne, is organising its first edition of the “Very Burgundian Trip”. The goal? 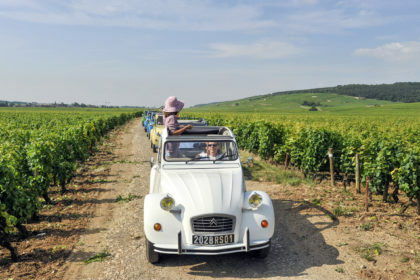 To promote Burgundy, its vineyards and its local environment with an entertaining, educational and convivial event: a vintage car rally taking in the region’s legendary sites. 8 a.m.: Description of the route in front of the Cité de la Gastronomie in Dijon: distribution of road books to each crew, which will allow everyone to get to know the Route des Grands Crus between Dijon and Beaune, as well as its history and wines, and to take part in some very convivial group activities. 9 a.m.: Cooperage workshop: the cooper will present his profession (the choosing of the oaks, the storing of the staves outdoors for 24 months, the cutting of the staves, the skirt assembly with the 1st strapping, the heating on the brazier and the 2nd strapping, the making of the bottoms of the barrels and their fitting, as well as finishing) and teams will assemble barrels. Teams will assemble the staves (wooden slats) beginning with the 1st circle. 11.30 a.m.: Wine-tasting session in the heart of the vineyards: presentation by our guides of the concept of AOC (Appellation d’Origine Contrôlée) in Burgundy, the grape varieties and winemaking methods. Evening: Check-in at the hotel and the Paulée de Beaune gala dinner at the Hospices de Beaune. Dinner will feature music by a gypsy jazz band. The results of the rally will be announced during the evening.